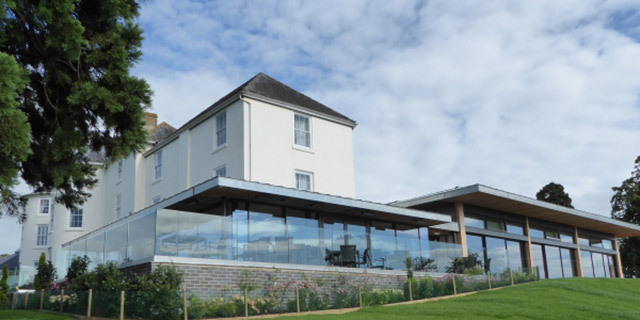 The first phase of a £6m masterplan to restore and reconfigure Tewkesbury Park Hotel, Golf and Country Club in Gloucestershire has been completed and is open for business. Guests at the hotel, which sits in 176 acres of ancient parkland, now have stunning views of the historic landscape from the comfort of a fully glazed new function room. ‘The view from the hotel is so incredible, particularly when the sun goes down and the whole valley beyond is bathed in light, we felt it vital to capitalise on the natural beauty of the environment by making the view a central feature of our design,” comments Mike Cox, director of Childs+Sulzmann responsible for the scheme design. Childs+Sulzmann Architects were appointed , because of their significant experience in the commercial development of country house properties and their successful management of challenging planning applications associated with heritage assets in sensitive locations. This experience was invaluable in achieving planning for this development with part of the hotel building being the original listed manor house and because of historic nature of the site. The ancient parkland in which the hotel sits was the location of the Battle of Tewkesbury in 1471, one of the decisive battles of the Wars of the Roses. Childs+ Sulzmann were previously responsible for the refurbishment of the hotel and then developed a masterplan for the whole site including the golf club and leisure facilities. The opening of the function suite marks the end of the first phase of this development.